Manufacturer of ventilated geodesic domes, erected on your site by our crew, or our "Dome Expert" comes with your kit to instruct your crew. Whether you live in the United States, Canada, or Costa Rica you should know the name Scott McLeod Manufacturing. We have built and lived in domes for over 30 years and have designed a VENTILATED dome system that is 2 dome shells in one. We've been "building green" for over 30 years; geodesic dome structures require 1/3 less building material, resulting in a 40% to 60% more energy efficient structure. This is because if the air flow cannot move, your dome will eventually build up moisture and can disintegrate your studding and exterior of the plywood, which will cause mold. With our ventilated system, you are actually getting 2 domes. You have a dome shell within a dome shell, therefore allowing the movement of air to naturally flow throughout the dome panels. Explore the rest of our website to find out why our ventilated geodesic dome structures are some of the most affordable, efficient, comfortable, and strongest wood structures ever built. 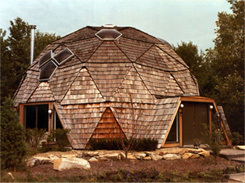 A ventilated geodesic dome from Scott McLeod Manufacturing is the best decision you can make!